If you frequent the beach, you know the value of a good beach chair. It allows you to comfortably relax along the shoreline while enjoying the beautiful environment. You also save yourself the trouble of having to sit on the sandy shore or rely on a rugged chair. However, we all know that not every item will suit your need. Some will be bulky and cumbersome to carry around; others will be too low or too high, while there are types that don’t fold easily. You also may end up buying a very heavy chair, a weak one, or one with very flimsy and rigid fabric. Before we begin the countdown of the top 10 best beach chairs in 2019, why don’t we look at the important features? Design : The right chair will come in a user-friendly design. It will be strong, stable, not too low to the ground or too high, and will also look elegant. Sturdiness : It’s built from strong frames and materials that can put up with the outdoor environment and the elements. The frame is rust/corrosion resistant and the material is tear, wear, rip and water-resistant. Comfort : A good chair comes in a good size, is ergonomic and also very comfortable. The material is smooth, light and comfortable, and the armrests are padded. Portability : The chair is easy to carry and will easily fold into a small pack. Top types are made from light frames such as aluminum and fold flat. Weather-friendliness: The frame and material will tolerate the harsh sunshine, moisture, rain, strong winds and salty atmosphere. Size : It’s important to choose a chair depending on your weight and height. A too big or too small a chair will be uncomfortable and will make the experience not very worthwhile. One thing we must appreciate about this beach chair is its elegant styling. It looks good on any beach and is suitable for men, women, adults, and children as well. It also comes in a good size of 3 x 24.7 x 36.3 inches and will comfortably sit even heavy users. The fully padded lounger comes with padded armrests and an adjustable backrest for maximum comfort. The stainless steel frame is strong, light and resistant to rust, corrosion, and fading. Carrying the chair shouldn’t be a problem thanks to its light weight of 6 pounds and the included shoulder straps. We also can’t forget the handy and convenient cup holders and large zippered pockets. Some users nonetheless complain that the armrests are not very sturdy. 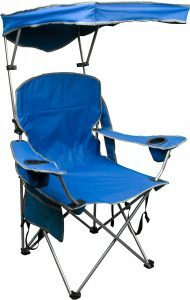 If you love heading to the beach, backpacking, tailgating, or camping, this light blue chair should be perfect. The folding chair is made from light but strong steel and comes with a 10-inch height. Not only is it strong to support users as heavy as 225 pounds but also folds into a small pack for better carrying and storage. The 5-pound chair features molded plastic arms for better support and adjustable backpack straps for improved portability. While people love its comfort, sturdiness, and easy folding, some complain of its non-reclining nature and its small size. 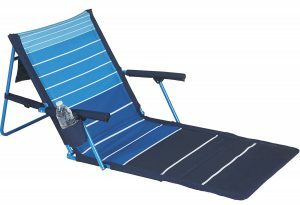 Your search for the perfect beach chair will end once you acquire this blue folding chair. Measuring 68 x 35.82 x 21.25 inches and weighing 5 pounds, this stylish accessory can handle weights up to 225 pounds? This is credited to the heavy-duty, stain-resistant and water-resistant 600D polyester and the strong steel frame. The powder coating of the frames improves longevity and adds the chair’s glamor whereas the patented design makes adjusting the shade or tilting the canopy easy. The well-built, portable, and light accessory features mesh cup holders, storage pockets and is also suitable for the park, campsite, tailgating, picnics, sporting events and more. The Coleman brand always comes up when talking about beach chairs. 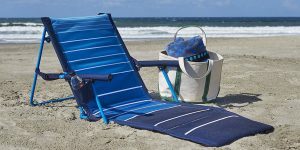 One of their key products is this citrus-colored beach sling chair that measures 26 x 21 x 26 inches and weighs about 6 pounds. It’s a crowd puller courtesy of its high-quality fabric and steel frame that is tolerant to the elements and its low to the ground design that enhances comfort. Setting up and folding the chair is simple and easy due to its user-friendly design and lightweight. People also choose this product because of the mesh holder cups, seatback pocket, soft material, strength and amazing comfort. Some, however, say it’s a bit too low to the ground. Don’t be deceived by the simplicity of this chair for it can support up to 350 pounds. 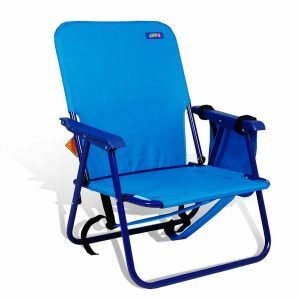 Designed for the beach, tailgating, camping, picnics, sports and other events, this colorful blue chair comes with aircraft grade 7075 aluminum and Terralite. Although weighing only 2 pounds, this item is very sturdy. Its TerraGrip feet prevent the chair from sinking into the mud, soft dust or sand. For improved carrying, the highly portable chair comes with Velcro straps and can be setup within minutes. It also features an easy access mesh storage bag. Others reasons to go for this item include its decent size of 5 x 5.5 x 16 inches, durability, sturdiness and high quality. Just as the name implies, you will fall in love with the Loveseat by Kelty. It comes in a colorful and vibrant Tundra/Chili Pepper color and is perfect for the beach, picnic, park, campsite and other settings. 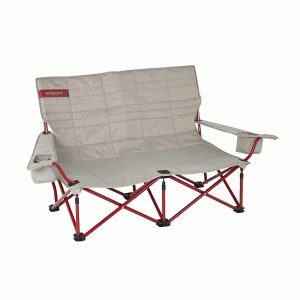 It’s constructed from a heavy-duty steel frame, which together with the quilted 600D polyester can support up to 400 pounds. It measures 23 x 45 x 12 inches and weighs about 8 pounds. For improved comfort and convenience, it can recline in different positions, comes with an adjustable armrest and an insulated beverage holder. 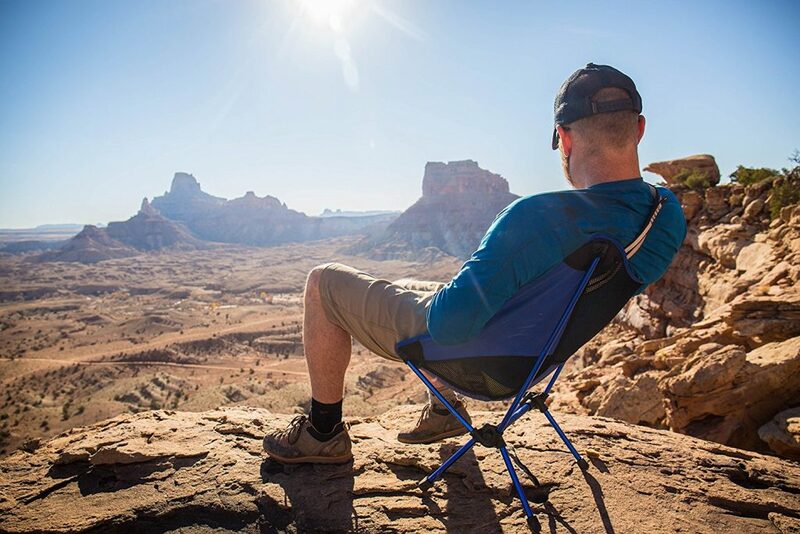 The Kelty Low-Love Chair is chosen because it’s super comfy, easy to pack, well built and elegant. However, some people say it’s a bit low to the ground. 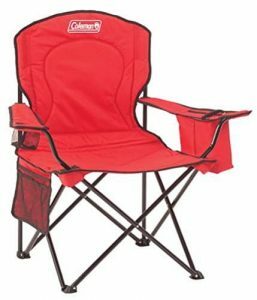 This red oversized quad chair will not just offer you a comfortable place to seat but easy access to cold drinks as well. This is credited to the convenient built-in armrest cooler that can hold as many as 4 cans. The spacious chair measures 26.97 x 7.72 x 7.48 inches, weighs around 9 pounds and is recommended for users weighing up to 300 pounds. 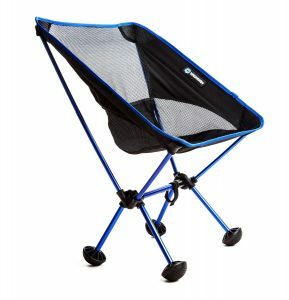 It features a sturdy steel frame and long-lasting polyester material. Also included are mesh cup holders, carry bag and side pockets. One of the issues users have with this comfortable, durable and sturdy chair is its heavy weight. 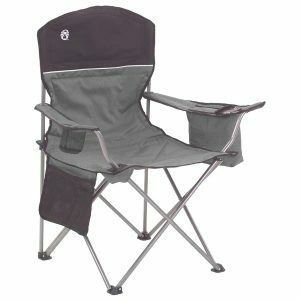 If you fancy having a cold drink while relaxing at the beach, park, picnic site, camping, or any other suiting, this gray/black quad chair should be okay. It is made of strong steel frame and heavy-duty polyester that can accommodate users weighing up to 325 pounds/147 kg. It features a cooler in the armrest that hold up to 4 cans, adjustable armrest height, and side pockets for storing snacks, books, magazines and other items. The light chair weighs 3 pounds, is comfortable, well-designed but is a bit bulky. 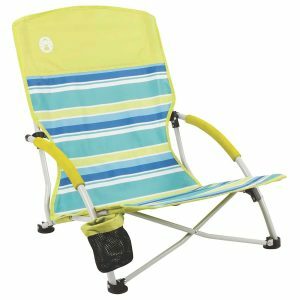 This King Camp Chair is perfect for the beach, camp, hiking, picnic, and tailgating among other uses. It’s available in cyan color, measures 26 x 23 x 22 inches, and weighs around 3 kilograms. Its sturdy steel frame and fabric can support users weighing up to 136 kg / 300 lbs and closes or opens within seconds. For improved comfort, the armrests are wrapped in a soft and smooth foam while the reinforced back is made from breathable mesh. The included compact straps and carry bag make carrying easy and convenient. Although it’s very comfortable, sturdy, and well-built, some consumers say it’s low on the ground. Become more comfortable and relaxed with this green/blue striped chair by Tommy Bahama. Made from high quality and sturdy 600D polyester and aluminum frame, it will comfortably and safely support up to 300 pounds. 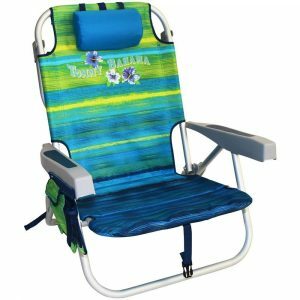 The 7-pound chair measures 23 x 3 x 27 inches and comes with a storage pouch, cooler and folding towel bar. The super light accessory can be adjusted in 5 different positions and also includes a built-in pillow for maximum comfort. It features several pockets, 2 large compartments and is easy to carry thanks to the ergonomic rubber handle. While consumers love its high quality, comfort, and good size, some claim that the front seat tube frame is a bit uncomfortable. Choosing the right product should now be easier. 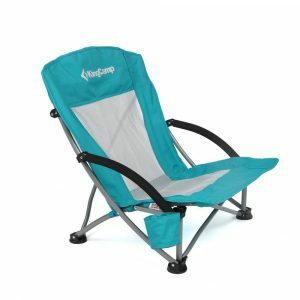 All you do is read this review about the top 10 best beach chairs in 2019, ascertain your needs and personal preferences, and then click on the item you think is best. Any item on the list is guaranteed to offer you maximum comfort, reliability, durability, and portability. They come in good design, decent size, are light, portable and easy to maintain. In addition to the beach, the accessories are also suited for other settings including camping, tailgating, camping, hiking, sports and more.